Only way to know if it is a good deal is to wait until the auction ends. I thought the starting bid of $4k was high. Lots o' rust in that bucket. But the lipstick helps it look better, for now. The paint job is hideous. It looks like someone spray painted the rustoleum from 10 yards away in high winds! I'd be scared what would be found under that "paint job" with the bus in metal. The engine compartment is scary. We all love seeing that Ford Pinto carb in place. $1400 for both doesn't seem too terrible? Granted, they are crusty Maine junkyard buses . man ,if i had the cash id be all over this. * It's a bondo bucket with lots of rust. The rear hatch seal is dried up and oversprayed. I'd hate to see this bus stripped naked in bare metal. HA! TDCTDI beat me to it. But I got the pics in! Look above your post haha. Pretty interesting bus, if it were closer, I'd be interested. Not sure where else to put this. Not so much a good deal as interesting. Delete if necessary. A TVA electric bus. I saw something here some time ago, but could not quickly locate the thread just now. One of those odd 1977 electric conversion busses. Everybody born before 1975 has a story, good, bad, or indifferent, about a VW. GOFUNDYOURSELF, quit asking everyone to do it for you! There are new vehicles matching your saved search New Saved Alert at Row52. Great way for a father and Son project, awesome opportunities. If you like VW's you are going to like this two. The buses will not be ship, cash only and pick up only. Please no calls after 9:00pm est. At least pick up the flag and store it properly , it hurts to see that . And curiously, no pic of the left side. Thats another 5k. Oops, wrong thread. That's a "smoke free" interior too. 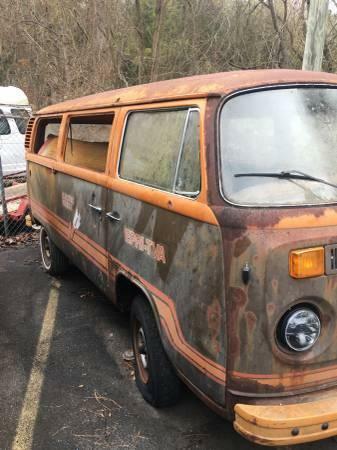 1977 Westy. 2.0 Fuel Injected.